Stratospheric Ozone Depletion and Increase in Ultraviolet Radiation, D-P. Häder. Making Links: From Causes to Effects to Action, C. Nolan. Consequences of the Effects of Increased Solar Ultraviolet Radiation on Aquatic Ecosystems, D-P. Häder and R.C. Worrest . Instrumentation and Methodology for Ultraviolet Radiation Measurements in Aquatic Environments, J.H. Morrow and C.R. Booth. Penetration of Solar UV and PAR into Different Waters of the Baltic Sea and Remote Sensing of Phytoplankton, H. Piazena and D-P. Häder . Biological Weighting Functings for Describing the Effects of Ultraviolet Radiation on Aquatic Systems, J.J. Cullen and P.J. Neale. Biological UV Dosimetry, G. Horneck. Role of Ultraviolet Radiation on Bacterioplankton Activity, G.J. Herndl. Optical Properties and Phytoplankton Composition in a Freshwater Ecosystem (Main-Donau-Canal), M. A. Häder and D-P. Häder. The Effects of Ultraviolet-B Radiation on Amphibians in Natural Ecosystems, A.R. Blaustein and J.M. Kiesecker. Impacts of UV-B Irradiation on Rice-Field Cyanobacteria, R.P. Sinha and D-P. Häder. 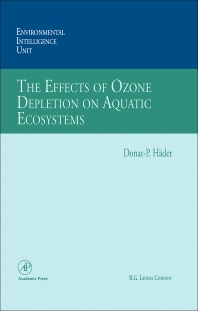 Studies of Effects of UV-B Radiation on Aquatic Model Ecosystsems, S.-A. Wängberg and J.-S. Selmer. Solar UV Effects on Benthic Marine Algal Assemblages-Three Case Studies, R. Santas. Effects of UV-B on Ciliates, R. Marangoni, B. Martini and G. Colombetti. Effects of Ultraviolet Radiation on the Pelagic Antarctic Ecosystem, M. Vernet and R.C. Smith. Index.